Beginning July 1, it will be illegal to hold a cellphone while driving in Georgia. Drivers will be required to use a hands-free device if they make a call. Penalties are in place for motorists who break the law. In May, Gov. Nathan Deal signed into law House Bill 673, also known as the Hands-Free Georgia Act. Deal traveled to Statesboro, the home of Georgia Southern University, to sign the bill. The families of five Georgia Southern nursing students who were killed in a crash on Interstate 16 in April, 2015 — attributed to another driver’s distracted driving — joined Deal as he signed the bill into law. “This is our effort to make sure that these tragedies are not going to occur needlessly again,” Deal said during the bill signing ceremony. Deal became emotional during the signing. He told the families, “I know that this legislation does not mend your broken hearts. I know that it does not make your hearts whole or relieve you of your memories. But, hopefully, it will prevent the same kind of pain and tragedy being suffered by other families in the future. Lawmakers who supported the bill said there is an epidemic of distracted driving cases. Distracted driving is defined by the Centers for Disease Control and Prevention as driving while doing another activity that takes your attention away from driving. Approximately nine people are killed each day in the U.S., and more than 1,000 injured, in incidents reported as involving a distracted driver, the CDC says. 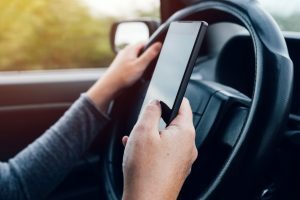 During daylight hours across the U.S., approximately 660,000 drivers are using cellphones or manipulating electronic devices while driving, according to the National Highway Traffic Safety Administration. In September 2017, Cherokee Sheriff’s Department deputies in unmarked cars spent a week in the Towne Lake Parkway area to observe distracted driving and hand out information about the dangers of distracted driving. Deputies stopped 230 motorists who were using a handheld device or doing something to distract their driving. Kelley said the department conducted the exercise to alert drivers to unsafe driving practices due to the high number of traffic deaths in the county. There were 35 traffic fatalities investigated by the sheriff’s office in 2017. “I would not be surprised if a few of those were from distracted driving,” Kelley said. Kelley said she hopes the new law will help. To see the bill Deal signed into law in its entirety, go to: http://www.legis.ga.gov/Legislation/20172018/178977.pdf. To read more about the new law, go to the Governor’s Office of Highway Safety website at: https://www.gahighwaysafety.org/highway-safety/hands-free-law. • Hold or support, with any part of the body, a wireless telecommunications device, such as a cellphone, or stand-alone electronic device, such as an iPod. The use of an earpiece, headphone device, or device worn on the wrist, such as a smartwatch, to conduct voice-based communication is not prohibited. • Write, send or read any text-based communication, including text message, instant message, e-mail or internet data on a wireless telecommunications device. • Watch video or a movie, other than watching data related to the navigation of the vehicle. • Record or broadcast a video. • Text if they use technology that converts voice to text messages. • Use a handheld device for navigation of a vehicle or for global positioning systems purposes. • Have a phone in hand to make emergency calls to report a traffic crash, criminal activity, fire, medical emergency or hazardous road conditions. • Use a handheld device in a vehicle if lawfully parked in an area open for parking. • The first conviction of usage of a wireless telecommunications device brings a fine of not more than $50, and one point on the motorist’s driving record. • A second conviction within a 24-month period brings a fine of not more than $100, and 2 points on the motorist’s driving record. • A third conviction within a 24-month period brings a fine of not more than $150, and 3 points to the motorist’s driving record.